If you check out almost any tattoo blog or the websites of tattoo artists, chances are you’ll find a whole lot of information about what to do after you get your tattoo. Just about every online space concerned with tattoos will have resources that walk you through detailed aftercare instructions. Of course that’s great, because improper aftercare can have some nasty consequences, but what about before you get a tattoo? Is there any important information you should know when preparing for a new tattoo? There is. While it might not always be as crucial as the care you take after getting your tattoo, smart pre-tattoo preparation can still make a big difference. 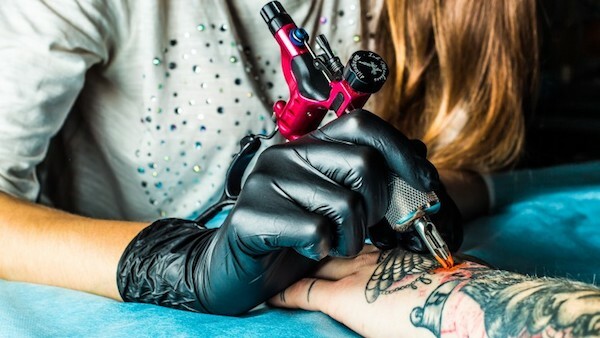 In this article, we put together the most important steps you should take and things you should consider before stepping into the tattoo parlor. How healthy your skin is can affect how it reacts to being tattooed, as well. For this reason, it makes sense to take whatever steps you can to ensure your skin is in good shape before you get tattooed. Drinking plenty of water isn’t just a way to make sure your body functions well; it’s also critical for keeping your skin healthy. By keeping your skin healthy, you will heal and recover more swiftly between tattoo sessions and after the tattoo is complete. Therefore, don’t neglect your water intake. Remember, you’re getting your skin tattooed, not your body hair. Shave away any long or thick hair that could obstruct the tattoo needle and cause complications for the tattooing process. While tattoo artists will generally have razors and shaving cream on hand to do this for their clients when needed, it’s not a bad idea to save time and make your session more efficient by doing it yourself. Be cautious when shaving, however, since any cuts or nicks will have to heal completely before you get your tattoo. Using the tattoo gun to apply the ink to your skin is a delicate procedure and any obstacles to a clean and simple application can result in a tattoo with some imperfections. Make sure you keep your skin clean and exfoliate, especially on the morning of your tattoo. Getting rid of any dirt and dry skin will make it simpler to tattoo your skin. Your morning routine might involve all sorts of lotions or skin creams, but you should consider skipping any that aren’t necessary on the day you’re getting your tattoo. Skin is a different medium for an artist to work with, so the best thing to do is to make sure it’s clean and free of any products to make it easier for your tattoo artist to apply the ink directly to your skin. Be diligent about applying sunscreen on the weeks leading up to your tattoo. A sunburn is something you definitely do not want when the day of your tattoo comes. Not only would it make getting the tattoo even more painful, but it could also prevent it from healing properly. You want to be comfortable when you’re in the tattoo artist’s chair, but you won’t be if you’re exhausted. Go to bed early the night before and give yourself plenty of time to fall asleep, especially if being nervous about getting tattooed might keep you up a bit later than usual. Being tired will also make the session feel like it’s taking longer, so make sure you’re not spending the entire time in your tattoo artist’s chair yawning and feeling the urge to stretch your weary muscles. Again, you’ll be sitting through the tattoo session for an extended period of time, so don’t show up on an empty stomach. Make sure you eat and drink enough before coming – not so much that you’ll feel bloated or uncomfortable, but enough that your stomach won’t growl and you won’t feel parched. If you’re going to be sitting for a particularly long session, you might want to bring a small snack and something to drink. Bring something light that’s also easy to eat, so you can have it when there’s a moment of downtime but still finish it quickly enough that you’re not holding up your artist when they’re done taking their break. Also, don’t bring any messy foods in. Tattoo artists like to keep a clean studio, so avoid anything that will easily spill or leave crumbs. Firstly, you will be spending a long time under the tattoo gun, so you don’t want to be wearing something that feels itchy, too tight, or that you need to constantly readjust. Secondly, you want to make the area you’re getting tattooed is easily accessible. If you’re getting your calf tattooed, for example, show up in shorts or a skirt instead of skin-tight jeans. Be aware that when you show up dressed in a way that doesn’t give easy access to the skin you want tattooed, you will likely have to remove some of your clothes. Tattoo artists are used to seeing just about every part of their clients’ bodies, but you might not feel completely comfortable if you have to take off more clothes than you would otherwise need to. You might feel more relaxed when you have your phone in hand, but this is not the right time to keep actively using it. For one thing, the constant buzzing of notifications will be distracting to your tattoo artist (and who wants to get tattooed by someone who is distracted?) Continuously checking your notifications might also be a problem, since you it means you’re moving when you should be holding still. If it helps you put up with the pain or the length of the session, you might want to use your phone to listen to music. That’s usually fine, but ask the tattoo artist how they feel about it before you do and wear earbuds so the music doesn’t distract them. We get it, a lot of people are scared of needles, worried about the pain, or just plain nervous about the whole experience. Nevertheless, resist the urge to use drugs or alcohol to steel your nerves before getting tattooed. Alcohol thins the blood, so showing up drunk might compromise your tattoo or put you at higher risk. You might also have to make some on-the-spot decisions about your tattoo and you want to have a clear head when you do. No one wants to live with permanent choices they made while they were under the influence. And then there’s the fact that being drunk or high might make you a lot less pleasant to be around (no matter how charming you feel). A tattoo is a professional exchange and you want to bring your best self to the tattoo session. Finally, being anything but sober might make it harder for you to sit still and remain calm. Note that most tattoo artists will turn you away if you are noticeably drunk or high. You want to be comfortable and confident about what you’re doing, so don’t hesitate to ask your tattoo artist or any of the other staff any questions you might have. If you want to know what kind of procedures they have in place to make sure their equipment and facilities are kept safe and clean, ask them to give you a quick run-through of them. Not only might it ease your nerves, but it’s a good way to make sure you’re getting tattooed with properly sterilized equipment. You should also raise any concerns you have about the tattoo itself. If, for example, you’re not sure whether a certain color will come out looking great with your skin type, bring it up to your tattoo artist – don’t just cross your fingers and pray it comes out right. Some tattoo artists will offer free touch ups (if you follow the aftercare routine they recommend), but don’t assume they will. If you’re wondering whether touch ups will be covered, now is the time to ask. Although, strictly speaking, it is entirely optional, it is customary to tip your tattoo artist. Factor the tip into the overall cost of your tattoo and make sure you have enough cash on hand (or money in your bank account, if you’re paying with a debit card) to cover it. There’s no set or predetermined tip amount. Unlike tipping waitstaff, we haven’t collectively come up with a fixed custom for tipping tattoo artists. Still, it’s best to avoid tipping too little or too much, and a good rule of thumb is to tip around 15 to 20 percent. You might want to bring someone along with you, especially if you’re nervous and want some moral support. Whether you should or not depends on a few different factors. If the tattoo studio is on the smaller side, there might not be any room for additional people without them getting in the way of the tattoo artist. In addition, you should never bring more than one person, since that is bound to make things crowded and interfere with the tattoo artist’s work. If you do want to bring someone, always ask ahead of time to see if it’s alright and respect your tattoo artist’s wishes. They know what kind of space they’ll need to do their job and they might also have had bad experiences with tag-alongs in the past. Also, you should never bring a child with you while you’re getting tattooed. It is difficult for children to sit through long tattoo sessions patiently. While you’re getting tattooed, you also won’t be in a position to stop them from touching the equipment or digging through drawers and cupboards and it isn’t fair to your tattoo artist to put that responsibility on them. You’re excited to get your tattoo done and you might have had to wait a long time for your tattoo artist to have an opening. Maybe you even had to ask for time off work and line up a babysitter. Still, you shouldn’t hesitate to postpone your appointment if you need to. If you get a sunburn, wake up with a pounding headache on the morning of your session, or have come down with a contagious illness, call your tattoo studio and let them know. They’ll gladly reschedule you instead of making you come in under those conditions.